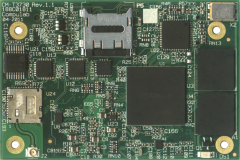 ARM module featuring high performance in a low-power envelope. Advanced video and graphics enable multimedia applications. Ideal choice for mobile and battery powered systems. 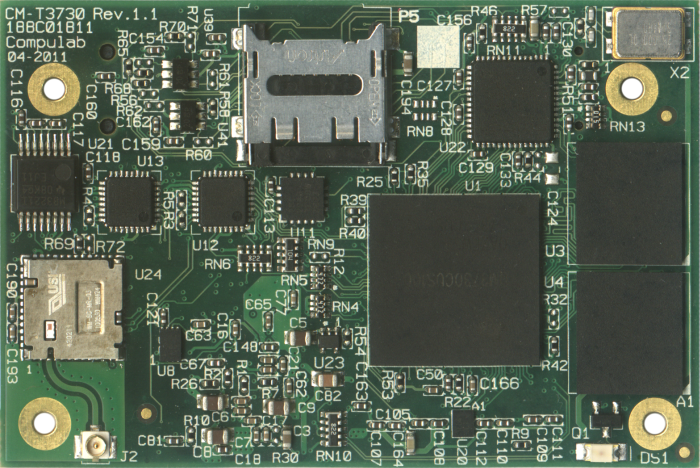 Onboard micro-SD socket / up to 512MB NAND for bootloader and storage. CM-T3730 is a small computer-on-module (CoM) / system-on-module (SoM) board designed to serve as a building block in embedded applications. 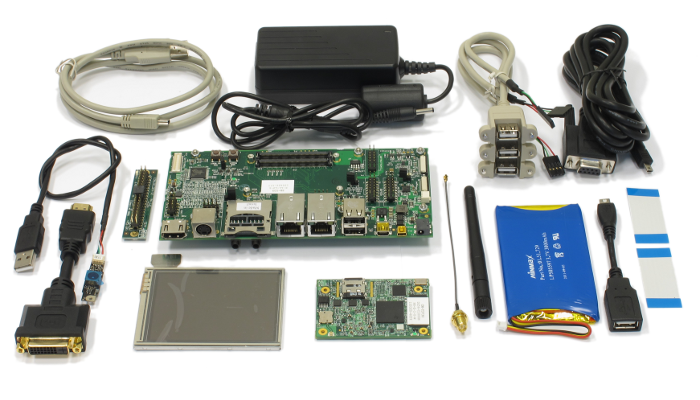 The CM-T3730 features all the components required to run operating systems such as Linux and Windows CE. Ready packages for these operating systems are available from CompuLab. The small size and low power consumption of CM-T3730 allow its integration into hand-held and mobile devices, while its low price makes it an ideal selection for cost-sensitive embedded applications..
CM-T3730 is based on TI's 1GHz DaVinci DM3730 processor which combines two CPU cores in single package - an advanced Cortex-A8 ARM CPU and TMS32064x DSP for dedicated video processing. TI's new 45nm processors combined with low voltage Mobile DDR enable very low power consumption in regular operation and in standby. CM-T3730 I/O provides a general purpose local bus, 100Mbit Ethernet, serial ports, GPIOs and other essential functions, while integrated WiFi & Bluetooth interfaces implement industry standard wireless connectivity. The standardized CAMI ("CompuLab's Aggregated Module Interface") connectors of the CM-T3730 module allow interchangeability with other computer-on-module's available from CompuLab, enabling the flexibility required in a dynamic market where application requirements can change rapidly. CPU Texas Instruments AM3703 (800MHz) / DM3730 (1GHz, DSP, PowerVR SGX) CPU. NEON™ SIMD Coprocessor. L1 cache: 112 KB (DSP), 64 KB (ARM). * NAND flash disk and micro-SD socket are mutually exclusive configuration options. WiFi and Bluetooth Interface Implements 802.11b/g/n wireless connectivity standard. Ad-Hoc and Infrastructure modes. Based on TI WL1271L chipset. On-board connector for external antenna. For previous versions of the CM-T3730 software packages, please refer to the CM-T3730 software archive.